“In Focus” is a local Economic Development initiative and each month our Forestburg newsletter and Facebook page will provide an “In Focus” review of services and background on a local business. The objective is to promote local business and encourage residents to shop locally; there by supporting independent business, which will in turn help our community remain strong and vibrant. This month “In Focus” looks at The Apothecary Shoppe Ltd, which was branded under Apple Drugs, and has now rebranded under I.D.A. Pharmacy effective Jun 2017. It is independently owned and operated by Peter and Kari Fenrich, under the I.D.A. Pharmacy brand, and has 6 employees. New signs have been installed to reflect the (Independent Druggists' Alliance) I.D.A. Pharmacy branding. I.D.A. was founded, in Canada, in 1932. This year they are celebrating their 20th year of serving Forestburg and the surrounding community and plan a more formal anniversary celebrations/recognition in the spring of 2018. Peter and Kari started The Apothecary Shoppe Ltd on 1 Jul 1998 at its present location, providing Pharmacy services to the area. The building was originally rented from Coutts Hardware and Forestburg Transit Mix (the landlords) until Aug 2006 when they purchas ed the building. So why the rebranding to I.D.A. Pharmacy? Peter and Kari saw an opportunity to provide better pricing, selection and variety of quality national brand products to their customers and private label choices under the “ATOMA” brand product line. They see this as a positive change and as such they have signed a 10-year contract with I.D.A. 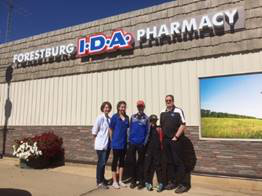 Peter and Kari are in this for the long run and intend to remain in the area providing the same great service to Forestburg and the surrounding community. Since 2010 they have operated “The Source” franchise from the same location. This provides the community with some instore “Source” products along with the option of purchasing items on-line and having it shipped for free, to their franchise outlet, for pickup. They are also very involved in the community and support various activities including local raffles, tournaments, curling rink, golf club, arena, hockey teams, school events, 4 H Club, concert series and welcome baskets.